Smartisan Technology, a Chinese smartphone company, was pretty much regarded as a joke in China, for it was founded by Luo Yonghao, an English teacher who is famous for performing live talk shows. Till Robert Brunner, founder of Ammunition Group, showed up in an video explaining their design philosophy behind the first Smartisan phone, Smartisan T1, at the launch event tonight. Brunner mentioned two points that I think may be the reasons his company would like to work with Smartisan. One is its emphasis on design and the other is “bringing the great design to the Chinese market.” The customized Android system the company launched in March last year wasn’t well received as many people think it’s just a redesign of app icons. The updated system shown tonight is still about incremental redesigns of some features. The second is easy to understand that everyone understands what “Chinese market” means. It’s unknown how much money Smartisan spent on hiring such a design firm who designed consumer electronics such as Beats headphones which are well received in China. 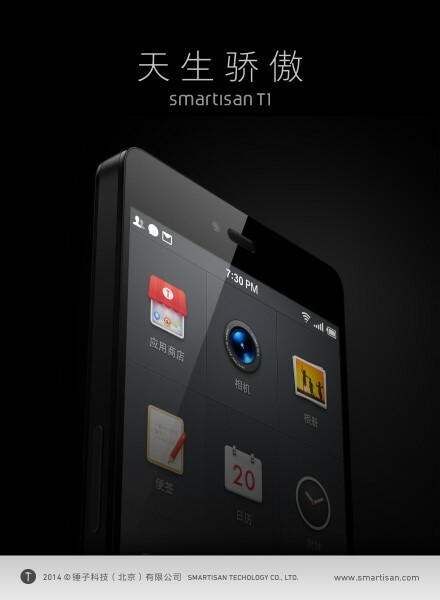 What’s for sure is Smartisan isn’t short of money for now. The company announced Series A round of funding at a valuation of roughly $76 million at the end of 2013 and a new round of RMB180 million ($29million) last month at a valuation of more than RMB1 billion ($161mn), according to the founder. Although many people make jokes about Smartisan, some of its investors have strong confidence in it. Zheng Gang, an early stage investor, told TechNode earlier this year that he was confident about the first Smartisan phone after he got a look at the prototype. The two models of Smartisan T1 will be on sale in early July at RMB3000 (roughly $480) and RMB3150 (less than $510), respectively. Their 4G versions will be available later and sold at higher prices, RMB3500 ($570) and RMB3650($590), respectively. While most of the newly emerged Chinese smartphone makers, such as Xiaomi, are focusing on high-spec, low-cost Android phones, apparently Smartisan’s strategy is selling design at higher prices.